kk7198 Provided mother can hold at current price tomorrow. 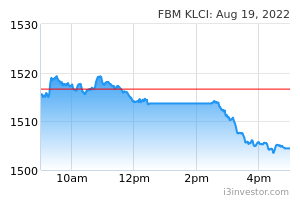 kk7198 If mother can hold, warrant can go high cos the issue share is small...around 52million. kk7198 The new management team looks great except the share price has gone up a bit high. kk7198 Maybe the previous directors cashed out at these agreeable prices. So,warrant can rise to 1.00+?? kudamuda mother could easily drop back to previous price..... that means warrant can also drop to 0.4?! kudamuda Be prepared to hold for mid term if you have confident of their JV future. Sharewanderer I told you right there wont be big drop but a surge in DWL's mother price. Guys faster join in the DWL's son boat before it fly again. 55c premium!!!! You thought it is so easy to have this chance? You gonna earn at least 6k from selling the shares by today or recently!!! it change name from SGB bec after conning ppl so many times.. they always come out with good news which will later not materialise..
n pump up high then drop back later... its issue share volume very small easy to do so..
Sharewanderer Join DWL warrant at the price of RM 0.595 before it is too late!!! There is 60 cent of premium from the selling price now! Catch it or you will lose the chance to earn big money!!! Stay tuned! vivoviva dont overpromote la sharewanderer. you bought high yesterday? hahaha. stay tune and watch it goes down to 0.30? Sharewanderer oKAY GUYS, LISTEN TO ME. I know why DWL son is sold at so high premium now, because the previous boss is disposing its warrant on hand, so you could see a lot of big block of warrant keep being disposed regardless of its price now cause the old boss could still earn money from the free warrant and that's the reason why you could see the volume of son share is so high. So once the previous boss dispose of all of the son's warrant, DWL son is gonna surge for more than 50 cents. 如鱼得水 after they disposed of at high price for wa... the mum shares will waterfall.. wa will fall faster, then they will buy back... they have been doing it many times..
Sharewanderer Come on I bought mother and son yesterday and till now still making profits. I just disposed my mother share @ RM 1.98 with a gain of 50 sen within just one day. Why I would like to trap you guys. Do you know why the share price is surging now? Look at this co revenue per quarter, it is just millions but not more than 10 millions. Its growth prospect is so great if they get any contracts from ECRL, for instance RM 5 billion and a 30% JV they will still be entitled to a 1.5 billion contract and earn a lot a lot of profits in the future. 如鱼得水 this con counter always got one person come out n promote telling story.. previously got 1 said her father was going to partner with them to do something, I forgotten what... after just 1 or 2 days, mum price free fall from above rm1 to below 1..
dwlwarrants anyone gonna convert warrants to shares? kk7198 @ruyudeshui, let's see this new management team.They have strong directors.Getting big projects are possible.Bought warrant at 0.51 sen this morning to average down yesterday at 0.655.
kk7198 Good money!I'm still keeping the mother. kk7198 @dwlwarrants, when you do conversion, scripts may take a few weeks to arrive in your account.By then, don't know whether game over liao. kk7198 @dwlwarrants,In that case, can do the conversion.Easy money.....grab more n earn more.